It’s saskatoon time here on the prairies. A little earlier than normal what with the heat wave we’ve been having. It’s a drag to have to turn the oven on, but it’s a sacrifice we’ll make to have a taste of these yummy tarts. The “recipe” is pretty fluid: for 4 cups of berries, start with a scant cup of white sugar, 3 tablespoons of corn starch, and a 1/4 cup of water. Stir the sugar and cornstarch together, then add the water. Add just enough water to be able to melt the sugar and cornstarch together. Pour over the berries in a medium saucepan and cook over low heat, stirring often, until berries release their juice, and mixture is hot and bubbly and has thickened. Taste at this point and add a bit of extra sugar if necessary. A teaspoon or two of lemon juice helps cut a too-sweet flavor. Let the berries cool about 40 minutes, stirring gently from time to time, then fill tart shells. 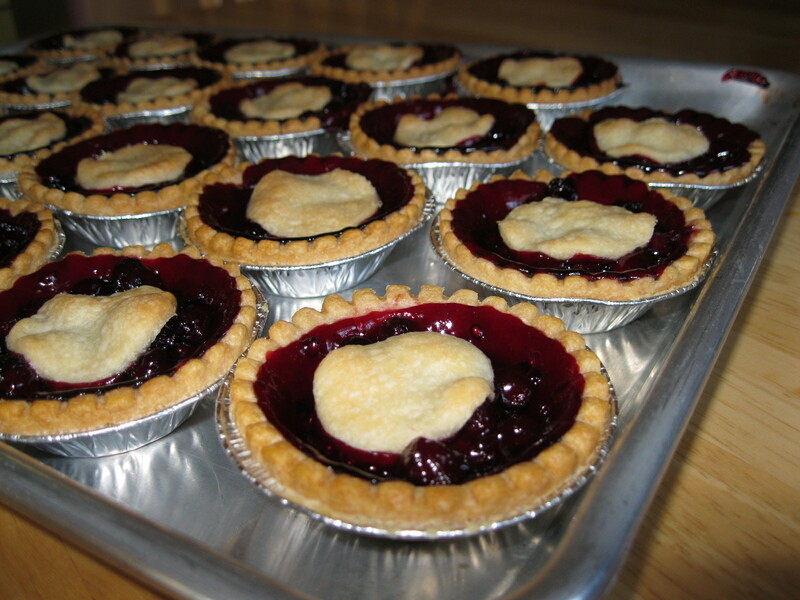 For 3″ tarts, use about 1/8 cup of filling per tart. A batch of filling this size should fill about 12-15 tarts. If you would sooner have a pie, this should be enough to fill one 9″ deep-dish pie shell. Bake the tarts at 375°F for about 14 minutes, until the pastry is golden and the filling is bubbly. Remove from oven and cool before serving. It’s saskatoon time here on the prairies. That means tarts, pies and jam, although this year I’m not feeling the jam and pies, gonna stick with the tarts. The “recipe” is pretty fluid: for 4 cups of berries, start with a scant cup of white sugar, 3 tablespoons of corn starch, and a 1/4 cup of water. Stir the sugar and cornstarch together, then add the water. Add just enough water to be able to melt the sugar and cornstarch together. 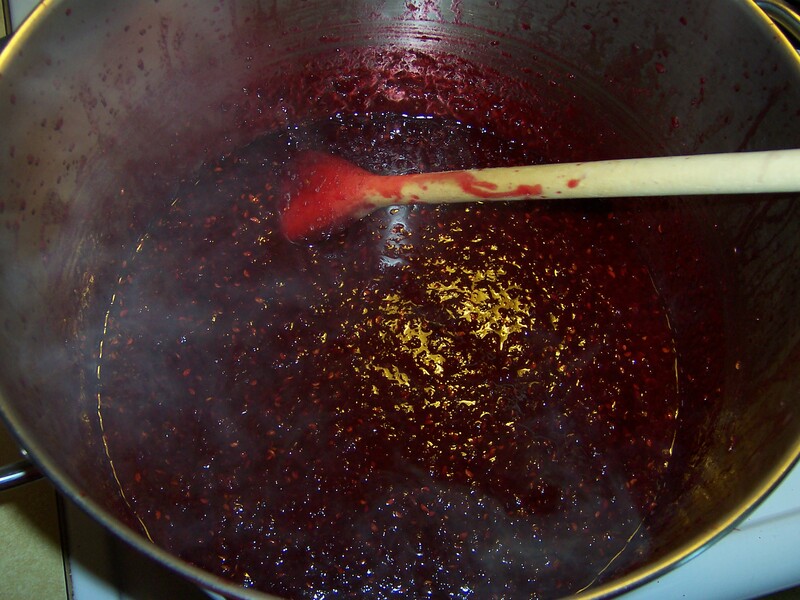 Pour over the berries in a medium saucepan and cook over low heat, stirring often, until berries release their juice, and mixture is hot and bubbly and has thickened. Taste at this point and add a bit of extra sugar if necessary. A teaspoon or two of lemon juice helps cut a too-sweet flavor. Let the berries cool about 40 minutes, stirring gently from time to time, then fill tart shells. For 3″ tarts, use about 1/8 cup of filling per tart. A batch of filling this size should fill about 12-15 tarts. Bake tarts at 375°F for about 14 minutes until pastry is golden and filling is bubbly. Remove from oven and cool before serving. When I was a kid growing up on the family farm, the fence line we shared with the neighbors contained a goodly number of saskatoon trees. My creative and inventive Mom concocted this recipe to use an abundance of rhubarb and saskatoon berries (two prairie staples!). It has become my most favorite jam of all. 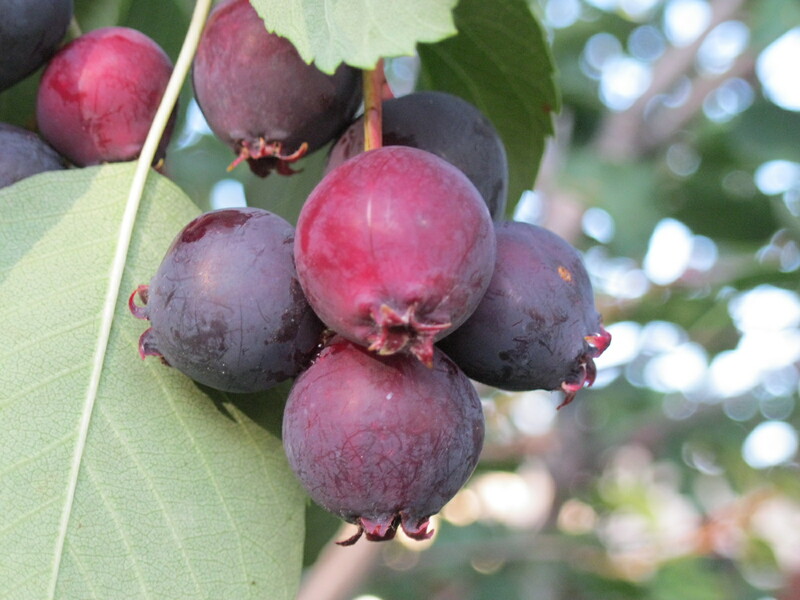 Now on our little city “acre”, Don has carefully cultivated 4 berry trees, well, actually 1 tree and 3 bushes. This didn’t seem like it would be a particularly abundant year, but there should be enough for a another batch of jam, and we’re hoping for a couple of pies! The blue jays that frequent our yard also enjoy the berries, although they don’t bother making jam. Bon Appetit – your morning toast should be so lucky to have a lick of this tasty treat! 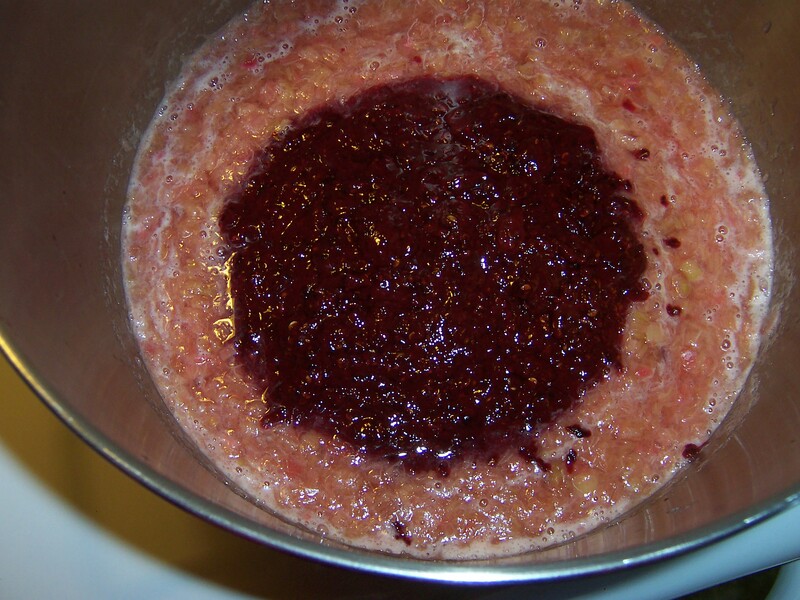 In a large pot, simmer together the rhubarb and ¾ cup of the water. Stir often and when completely soft, mash with a potato masher. Meanwhile, blend together the saskatoons and ¾ cup water. Add the saskatoons to the rhubarb and cook together for about 5 minutes. Stir in the sugar and mix well. Turn up the heat and boil and add Certo according to the directions for jam in the Certo package. 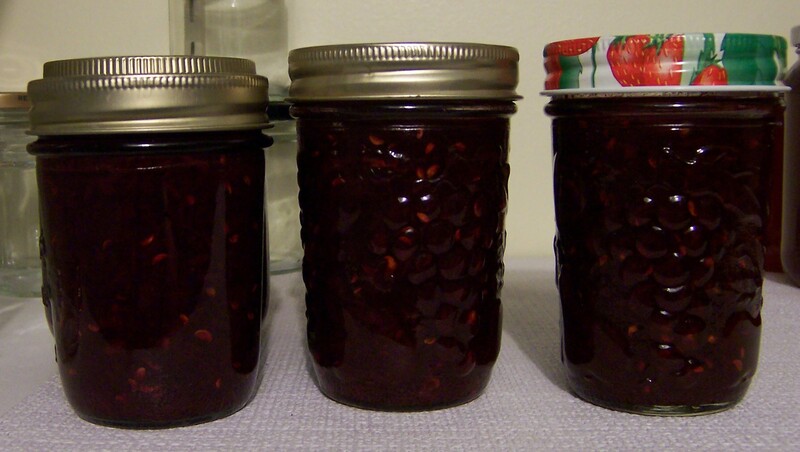 Makes 8 – 10 small jars of jam. 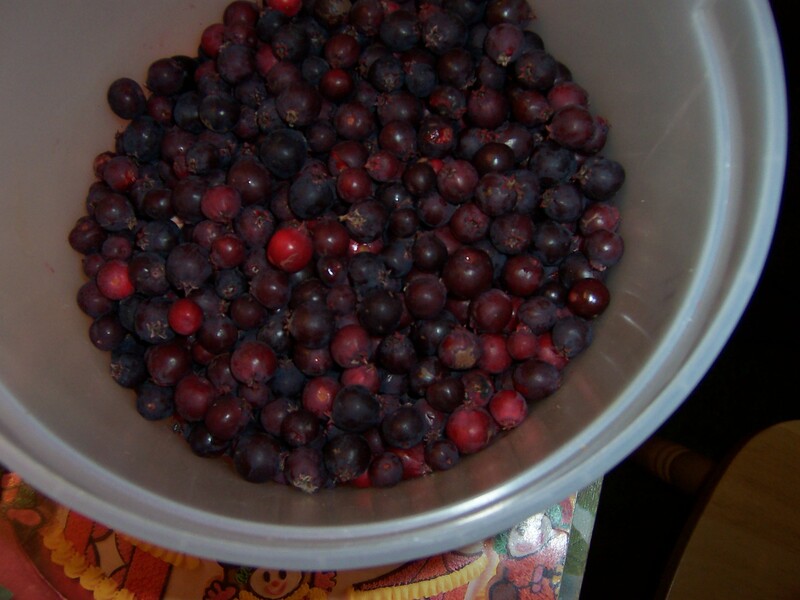 Note: Saskatoons have a high natural pectin content, so when you blend the berries, they will begin to gel immediately. You will have to mash them up to get them to combine with the rhubarb.